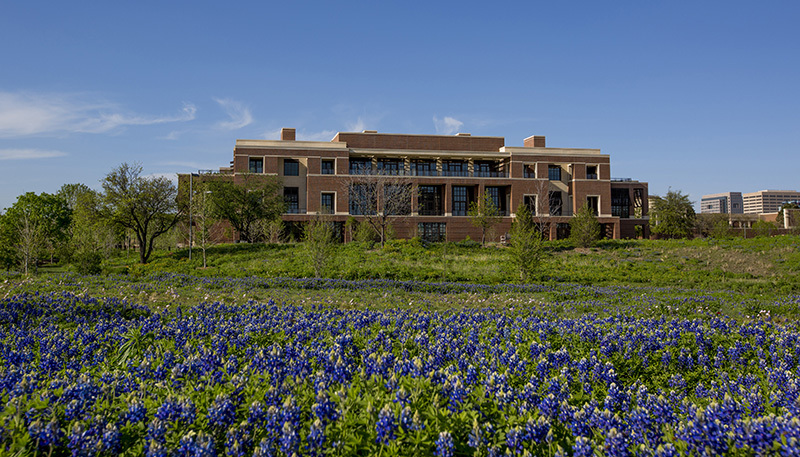 The environmentally conscious design of the Bush Center building and grounds reflects President and Mrs. Bush’s long-standing commitment to conservation. The Bush Center was the first Presidential Center to earn LEED Platinum certification for new construction, the highest level in the U.S. Green Building Council's Leadership in Energy and Environmental Design rating system. The Native Texas Park, open year round, reflects President and Mrs. Bush’s love of the native Texas landscape. Visitors can explore native Texas environments such as Blackland Prairie, Post Oak Savannah, and Cross Timbers Forest. Indigenous limestone is visible throughout the Texas landscape as the unifying material for both the building and the park, including the Carolyn and David Miller Amphitheater, providing a perfect place to pause and enjoy the urban oasis in any season. The 15-acre park is open all year, and is the perfect complement to your Museum visit. The Bush Center’s topography is the result of the re-use dirt excavated during construction of the building, and was designed to allow for the establishment of different ecoregions. The Native Texas Park is open from sunup to sundown 365 days a year. Pets are welcome. Embark on either a self-guided or group tour through the beautiful and sustainable park, building and grounds.